Provide comfort for the family of Susan Obery with a meaningful gesture of sympathy. 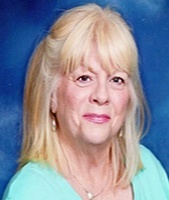 Susan D. (Stevens) Obery, 73, of Greenwood, IN passed away Wednesday, February 20, 2019 at Community Hospital South in Indianapolis, IN. She was born August 28, 1945 in Beech Grove, IN to Harry L. and Imogene (Kincaid) Stevens. She had been employed by the Center Grove Community School Corporation at North Grove Elementary and Center Grove Middle School in the cafeteria departments. She was a member of Our Lady of the Greenwood Catholic Church where she was part of the chapel service ministry. She was a member of the Brook Village homeowner’s association. She enjoyed reading. Survivors include her children John L. Cravens of Spencer, IN, Carla Luthe Mitsch (Patrick) of Merrillville, IN, whom she just recently connected with, and Brian M. Obery of Bloomington, IN; a sister Barbara Fazio (Jack) of Greenwood, IN; and two grandsons A. J. Jabarin and Romi Jabarin. Visitation will take place Monday, February 25, 2019 from 9 A.M. until 10:30 A.M. at Our Lady of the Greenwood Catholic Church, 335 South Meridian Street, Greenwood, IN, 46143 with Monsignor Mark Svarczkoph conducting a Mass of Christian Burial to follow at 10:30 A.M. Entombment will be in Forest Lawn Memory Gardens in Greenwood, IN. Memorial contributions may be made to St. Jude Children’s Hospital, 501 St. Jude Place Memphis, TN, 38105 or at www.stjude.org. Swartz Family Community Mortuary and Memorial Center, 300 South U.S. 31 (Morton Street) in Franklin, IN, is handling the arrangements. Online condolences may be sent to the family at www.swartzmortuary.com. Information at 317-738-0202. Visitation will take place Monday, February 25, 2019 from 9 A.M. until 10:30 A.M. at Our Lady of the Greenwood Catholic Church, 335 South Meridian Street, Greenwood, IN, 46143 with Monsignor Mark Svarczkoph conducting a Mass of Christian Burial to follow at 10:30 A.M. Entombment will be in Forest Lawn Memory Gardens in Greenwood, IN.